I still have a few weeks to go before I get to take my summer vacation, during which time, I will be forced to sit on a beach in direct sunlight. 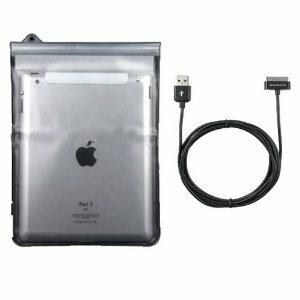 While looking for accessories to protect my gear, I came across the KHOMO Waterproof Case Cover for iPad 2. As far as I can tell, this kit is compatible with the original iPad also. The kit comes with what looks like a giant zip bag with a velcro secured flap. The bag also features a plastic loop that connects to a carry strap. The bundle I found over on Amazon also includes a 6-foot black sync cable and sells for $12.99 plus tax and shipping. There are other waterproof options available, all of which cost more than this bundle. If your iPad spend a lot of time near water, you might want to spring for a more expensive solution. Since I only go to the beach, if I'm lucky, twice a year, I might consider other options. 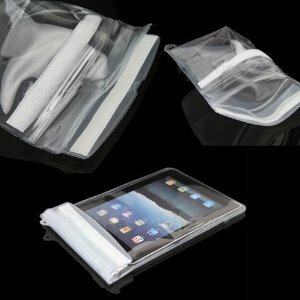 Since I'm most worried about keeping sand and drink spills away from my iPad while I"m traveling, this looks like the perfect balance between protection and cost.